This 1982 Volvo 243 could be one of the rarest Volvos ever produced or it could just be a nice custom job combining the best of the 242 and 244 models. So which is it? The story goes something like this: In 1982, Volvo set out to build its standard 242 coupe, but due to a certain malfunction at the factory the right side of the cars were produced with 244 sedan body panels. Volvo ended up shrugging its shoulders and continued the run for a total of 30 of these unique cars. It's said that upon completion of all 30 cars, Volvo sent them to Estonia to sell and offered them with a full factory warranty. 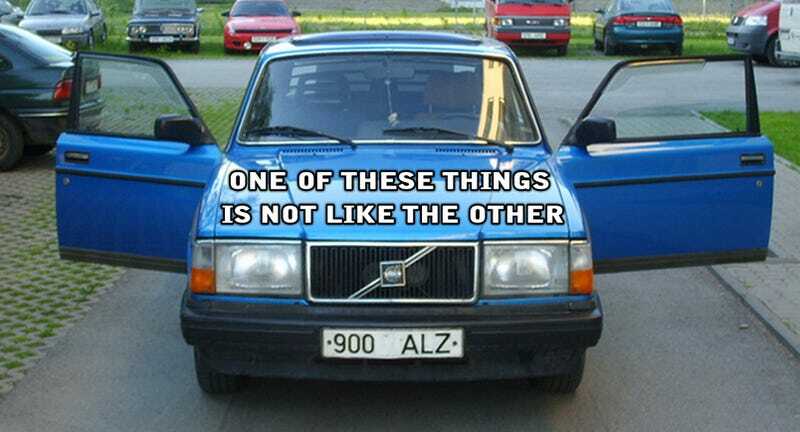 The other story that's floating around is that the Swedish Police had commissioned Volvo to build a special 3-door cross breed between the 242 and 244 models. The reason behind this request was to maintain a single point of entry for the backseat occupants. The police scenario is a little more likely than a muck up at the factory, but a lack of evidence and Volvo cooperation has led to a dead end. Yet another scenario is that this is a one-off custom job made in Estonia with a pretty vague wiki entry supporting its existence. We'll never truly know, but if it's a real-life factory job then we definitely need to locate one and add it to our resident Volvo-Man's collection.